Today was great fun. 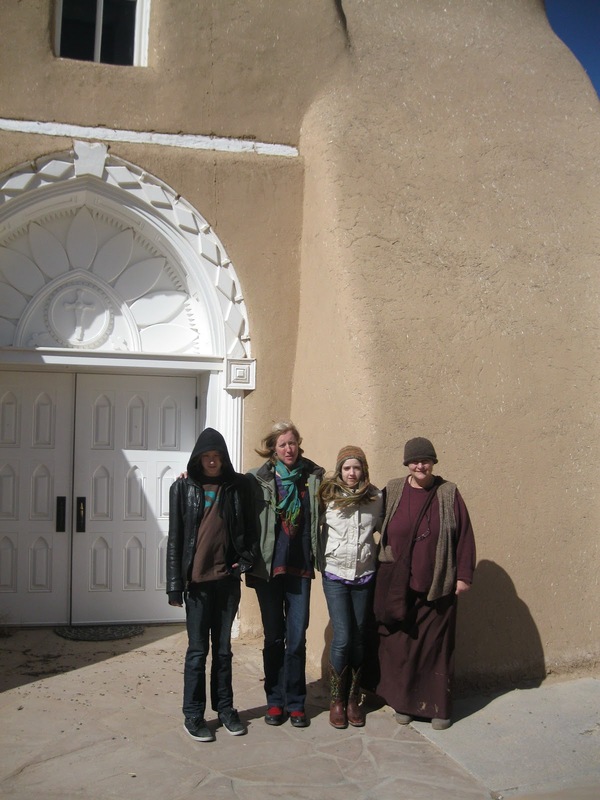 We hung out with Robyn, Lucy and Finn for a while this morning, then headed down to Ranchos de Taos under the guise of visiting the St. Francis de Asisi church that was made so famous by southwestern painter Georgia O'Keefe and photographer Ansel Adams. Built of adobe between 1772-1816, it is a world heritage church and is still an active parish in our community. My not so secret motive for this educational tour was to have lunch next door at the Ranchos Plaza Grill, which is THE best New Mexican food in town. I wanted our visitors to experience some good old home food, along with our beloved sopaipillas, heavenly pillows of deep fried bread. Sounds icky, but mmmmm good...the locals eat them for desert slathered with honey. How could you go wrong? We found a fixer-upper for Robyn! After lunch and our foray through the church, we headed out to the Greater World Community, hoping to visit the demonstration center and tour some earth ships. No such luck...they wanted $7.00 a person which is kind of a rip for what it is. Too bad. We opted for driving the dirt roads and gawking at some of the privately owned earth ships. It was decided, I believe, that this was not something worth leaving New York or Newfoundland for. Say what? You don't want to live miles from anywhere with no utilities or water? Well gosh; but having been there/done that, I can't say I had much to argue. We are having more unseasonably warm weather. Today the winds of spring hit us, and I mean winds, not breezes. Spring in NM is my least favorite season here and despite what the calendar may say, this is spring. Even the weeping willows are turning yellow in preparation for their new leaves. I have officially requested that when Robyn comes back, bringing Shawn, that they come in fall, when the air is at its best and the colors can blow your mind. Got that, Shawn??? I would love to check out this region. It is so different from New England...but just beautiful. We traveled across country when I was a kid, so I've seen that area a bit...but I'd love to really explore it! Martie, what is an earth ship?? An earth ship is a certain type of alternative home that was developed here in Taos by a man named Michael Reynolds. The basis for an earth ship is using old tires, aluminum cans, bottles, dirt, concrete and plaster. The homes are built to face the winter sun at its farthest point south, so during winter months your home has solar gain to warm it and when the sun is high above or behind you in the warm months, your home stays cool. This is how our own home (built of straw bales) works, so even with temperatures dipping well into the subzero range (Fahrenheit), so long as we have sunny days, our interior stays in the high 60s-low 70sF. While the idea of living in a home built with old (non-recyclable) tires isn’t for everyone, I encourage you, or anyone else interested in alternative building concepts, to check out the link I included about the Greater World Community and learn more. I’ve toured some of these homes, and they can be as creative and free form as their makers, and can be built for very little money but require more sweat equity than most people are willing to put into building a home. Because of this, there are many folks here in Taos who have great homes they can call their own when they could have never afforded to buy or build a more traditional home (and most likely a home that requires lots of energy to run it, costing more money and using far more natural resources). The late actor Denise Weaver was a fan and owned two, one here in Taos and a very large one in Colorado that was quite spectacular. Michael Reynolds and his crew have actually built demonstration earth ships all over the world, trying to show impoverished cultures in extreme environments how to realize the dream of home ownership with little more than lots of hard work. Wow, that is very interesting. I'd love to see them (someday). I'll check out the link. Thanks. 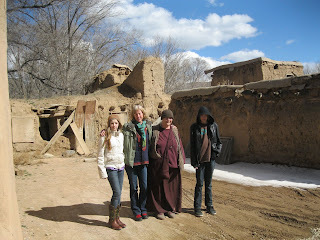 I'm glad you all had a good visit and the weather was cooperative for spending time outdoors being tourists.